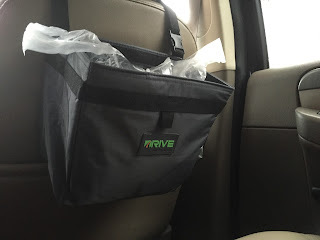 The Drive Car Garbage Can is a perfect addition to my truck's back seat. I have two tweens and they leave all kinds of trash on my back seat. Candy wrappers, gum wrappers, a broken pencil, etc. I hung this from the back of my driver seat on my daughter's side about 3 weeks ago and there has yet to be a wrapper, piece of paper, etc left on my back seats since. In fact, they are constantly cleaning up the console area of my gum wrappers which I leave in my coffee cup holder. It's awesome. The strap is adjustable and can go around the headrest of any seat or if you want to place it on the seat that's fine as well. It collapses easily or can be removed if necessary as well. This is perfect for your boat, car, truck, RV, tent. Whatever or wherever. It is very versatile. Not that I would recommend tossing your drink in there but it is also waterproof so if you need to dispose of a cup or water bottle there is no chance it will drip all over the car either. It can even be used as a drink cooler if necessary. 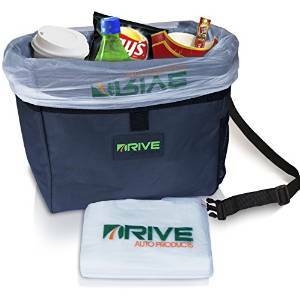 Add some ice and your drinks or snacks for a waterproof take anywhere cooler. There is even a drink holder on the side. I love that the company sends their own plastic bags too. Perfect! Disclaimer: I received a complimentary product for my honest opinion. My reviews are 100% honest and true based on my personal opinion not on a company's description or request. No monetary compensation was offered or received.